Many of our amazing supporters generously donated to help us get it fixed, and local businesses including Findlay Toyota and Anderson Tires were willing to assist with labor and parts. However, as is often the case with insurance companies, the process of estimating damage costs took a very long time. 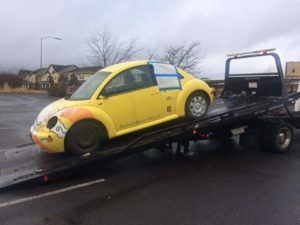 Biobug on the way to get fixed! Unfortunately, in March 2017, the insurance company went ahead and totaled the vehicle. It apparently sustained more damage than originally estimated. After quite a lot of back and forth (trying to save the vehicle), we all had to say our goodbyes, as it was towed to a salvage yard. We spent the summer trying to figure out our options. We wanted a vehicle that was not only reliable, but one that was aligned with our mission and vision. Just as our Center is a strawbale passive solar building, we felt that our vehicle needs to reflect the work we do and the values we teach. 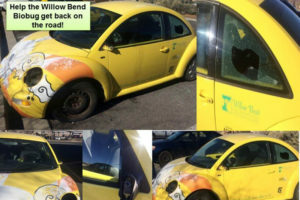 But our budget was limited to the generous donations we received to fix the Bio-Bug and from the insurance and it was hard to find a good, affodrable and reliable, fit. Outside Findlay Toyota ready to pick our vehicle (no, its not a truck). 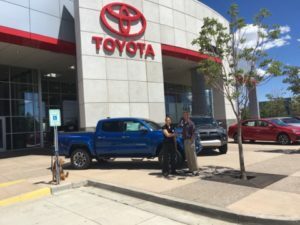 Drum roll please…We are super excited to announce, that Findlay Toyota in Flagstaff was willing to work with us and and gave us a significant break on an amazing vehicle. Curious? Want to meet the new Willow Bend Vehicle? Unveiling (and car naming contest) will take place during our Annual Members’ Celebration, Wednesday August 23rd 5-7pm (Can’t make the event? Follow us on FB, and our blog, as we will be posting pictures after the event). 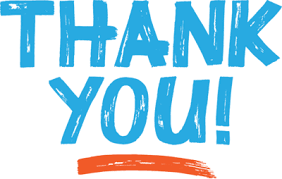 to EVERYONE who donated towards this cause and to Findlay Toyota for their generous support. Stay tuned for the unveiling and for the new name contest!